Daito-ryu aikijujutsu is a famous martial art that combines high level technical skills in jujutsu with mental and spiritual elements known as aiki. The written history of this true budo style starts with Sokaku Takeda (1860-1943), who is considered to be its founder. Today Daito-ryu is the most well-known among traditional jujutsu styles in the world. The techniques of Daito-ryu with their aiki elements are profound, taking years to master. For this reason, the number of people that are able to teach according to tradition is small. To develop genuine skills, students need to be as close to the art´s roots as possible. Takumakai is the largest Daito-ryu Aikijujutsu organisation in Japan. It was founded by the students of Takuma Hisa and Nakatsu Heizaburo. Takuma Hisa (1895-1980) was the only person to ever receive a Menkyo Kaiden (Certificate of Full Proficiency) from the founder Sokaku Takeda. There is a limited number of high-level teachers in Takumakai who have their own dojos. Most of those dojos are in the Kansai area of Japan. There are also dojos in Australia, the USA and Finland. Takumakai continually strives to provide high quality teaching and training in the art of Aikijujutsu. The aim of the organisation is not to spread Daito-ryu as far as possible, but to gradually expand the practice of this art whilst paying strict attention to sustaining a high level of quality. This is why there are very few Takumakai dojos outside Japan. Takumakai teachers follow a teaching tradition inherited from Sokaku Takeda. 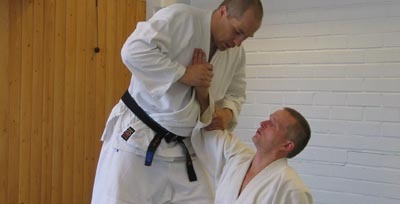 Teachers of Takumakai in Finland have had unique opportunities to benefit from the diversity of teachings in Daito-ryu Aikijujitsu by learning from all of the main Takumakai masters. There are currently only two dojos in Europe. Both are located in Helsinki (Finland). If you want to learn real Daito-ryu, please come to Finland to train in our dojos. We can also help you organise a Daito-ryu seminar in your location. Takumakai’s representive for Europe is Mr. Jyrki Rytilä. He teaches at the Fudoshin dojo in Helsinki, which is the Takumakai’s head dojo in Europe. Anyone interested in training in Takumakai Daito-ryu is welcome to come there to practice. You can also contact Jyrki if you are interested in organising a Daito-ryu seminar in your area. Fudoshin is the only club in Finland that has an official relatioship with Takumakai. Only Fudoshin has the authority to issue official belt gradings approved in Japan. Our teachers receive regular teaching form Japanese masters, and the quality of teaching is monitored. 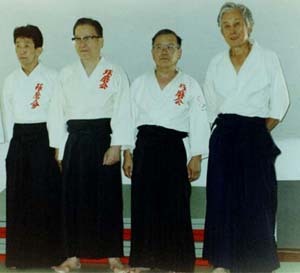 The only persons in Europe to whom Yutaka Amatsu sensei issued a teaching license (kyoju dairi) are teaching in Fudoshin. They are the only ones who can issue license in Soden techniques. There are following study groups in Europe that are practising under instruction of Mr. Jyrki Rytilä and Fudoshin dojo: Daitoryu aikijujtsu Takumakai Ukraine, Daitoryu aikijujtsu Takumakai France. If you have any questions or are interested in practicing Daito-ryu Takumakai, please contact us at:info@daitoryu.fi or jyrki.rytila@daitoryu.fi.